↑ Sayle, Murray (৫ এপ্রিল ২০০১)। "Japan goes Dutch"। London Review of Books, Vol. 23 No. 7। সংগ্রহের তারিখ ১৩ মার্চ ২০১৮। Murray Sayle: "The Netherlands United East Indies Company (Verenigde Oostindische Compagnie, or VOC), founded in 1602, was the world's first multinational, joint-stock, limited liability corporation – as well as its first government-backed trading cartel. 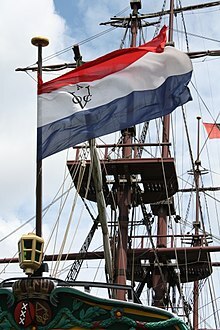 Our own East India Company, founded in 1600, remained a coffee-house clique until 1657, when it, too, began selling shares, not in individual voyages, but in John Company itself, by which time its Dutch rival was by far the biggest commercial enterprise the world had known." ↑ Roy D. Voorhees, Emerson L. Seim, and John I. Coppett, "Global Logistics and Stateless Corporations," Transportation Practitioners Journal 59, 2 (Winter 1992): 144-51.